Spoiler Alert: This post discusses a few of the elements of John Scalzi’s novel, Lock In. Nothing plot-related. As we go through Black History Month, I’ve put up a couple of posts on Facebook and otherwise about the Tuskegee Airmen and the museum’s programs. But Black History Month can’t help but make us think about diversity in an even broader way. 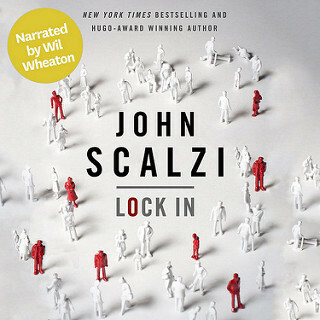 I’m re-listening to John Scalzi’s 2014 novel, Lock In. It’s a sci fi story set in a near future in which a flu-like epidemic has swept the world, killing many and causing others to suffer a condition called “lock in,” a state in which they are trapped inside their bodies, unable to move or communicate. In Scalzi’s story, after heoric efforts and trillions of dollars, the world figures out a way to implant neural networks in those afflicted with lock-in and enable them to participate in society by controlling humanoid robots: “Personal transports” or, colloquially, “Threeps” (in a nod to C3PO from Star Wars). Audible made two different audiobooks, one narrated by Wil Wheaton and the other by Amber Benson. That’s a rare thing for any story, and especially one that’s told in the first person. And it works because the story is equally compelling without regard for whether the protagonist is male or female. And, further, you don’t discover that the protagonist is African American until more than halfway through the story. Pretty cool. Especially when these facts of gender or race end up being purely ancillary to what is a nicely-paced and interesting story. Having it not matter whether the protagonist is male or female, and having the protagonist’s race be purely secondary or tertiary subtly convey that you can identify with a first-person protagonist no matter who you are. Or who he or she is. And, after all, isn’t diversity simply about identifying with people and walking in their shoes without regard for gender, race, or other things that don’t matter so much? Thank you, Mr. Scalzi. Well played. If you’re not already an Audible subscriber, you can get your very own copy of either version of Lock In by clicking here: http://audibletrial.com/AIRSPEED. You get a free audiobook with your free trial and Audible pays me $15 for reeling you in. I’ll spend the money on gas flying Tuskegee kids around, you get a great audiobook, and everybody’s happy. Even if you don’t go through the link, read or listen to Lock In. It’s a very good story and Scalzi is exactly the kind of guy you want writing the next generation of speculative fiction.